Each week, our friends at Total Football Analysis Magazine tactically preview our Fixture in Focus. Today, they bring us their thoughts on Man City vs Chelsea; a match that is bound to have an impact at the top of the Premier League. In December of last year, Manchester City travelled to London to face a Chelsea side that had impressed under their first-year coach, the Italian Maurizio Sarri. This match was especially interesting given the fact that neither side played with a recognised central forward. Chelsea started with Eden Hazard in a central role while City used Raheem Sterling as a striker of sorts given the absence of Sergio Aguero and the lack of form of Gabriel Jesus. The match itself was extremely tight. Despite the 2-0 victory for Chelsea, the xG score for the match was 1.13 to 0.69 in favour of the hosts. For those of you that are unaware this is an exceptionally low score in terms of expected goals for a City side who are exceptional going forward. The defensive performance from Chelsea in this match was excellent as they denied City the space to play in the central areas and cut off the supply to Fernandinho at the base of the City midfield. Throughout the first match between the two sides in December, we saw City struggle to build play effectively as Chelsea found a way to neutralise the effectiveness of Fernandinho by closing the passing lanes. With Hazard playing centrally he pressed the ball when City were looking to play out through their central defenders. Normally the triangle at the base of the City structure (the two central defenders and Fernandinho) work together effectively to create overloads that allow the ball to be progressed easily. As Hazard pressed though he kept Fernandinho in his cover shadow preventing the ball from being passed into the midfield. Even it was moved across to the second central defender we saw Hazard sprint across to press again and once more he prevented the pass through to Fernandinho. In this weekend’s match, though, we can expect to see Higuain play in attack with Hazard reverting to his role on the left. The Argentinean forward is a great goalscorer but his effectiveness when out of possession is not as prodigious as Hazard. Whilst Higuain may press against the ball initially he is far less likely to be able to cover across when the ball is played to the second central defender. This means that City will be able to easily access the pass into Fernandinho and from there the Brazilian can play into the two more advanced central midfielders. We may also see a second variation from City that will allow them to overcome the defensive structure that we are likely to see from Chelsea. In the match last week against Arsenal, Fernandinho played as one of the two central defenders. When out of possession we saw the Brazilian play as a normal defender in part of a back four. With the ball, however, Fernandinho rotated into the midfield and formed a double pivot with Ilkay Gundogan. This form of movement into the midfield would allow City to overload the space in front of the main defensive unit for Chelsea. Once again this will allow the ball to be progressed more effectively into the advanced areas. In the time since the first meeting between these two sides, there has been a considerable amount of unrest amongst sections of the Chelsea support who are unhappy with the lack of consistency in results. When the club turned to the former Napoli coach Sarri to take charge of the team it was generally thought that the Italian would take time to settle. Sarri is known to play a very specific style of football that needs players that have a skill set that would allow them to circulate the ball quickly in set patterns. There is no doubt that the Chelsea squad is talented but the addition of the former Napoli midfielder Jorginho was the only move towards incorporating this new style. In the early weeks, it looked as though the squad was adapting as Chelsea maintained positive form. In recent weeks this form has faltered and questions are being asked about whether Sarr-ball can be adapted for the English game. The main issue from a tactical standpoint surrounds the lack of movement in midfield areas around Jorginho. When Jorginho takes possession of the ball at the base of the midfield he is generally a very proactive passer of the ball, looking to access higher lines as quickly as possible. The issues in recent weeks with the Chelsea build-up have surrounded the lack of vertical passing options from the two more advanced midfielders. N’Golo Kante and Mateo Kovacic play as the No.8s in the system but neither have been effective in linking towards the final third. Kante, in particular, has taken time to adapt to his more advanced position and he prefers to hold a position along the same line as Jorginho in order to provide a passing option. This simply leads to ball progression being slow and the opposition being able to defend relatively easily. The same is true of Kovacic who will at least look to move wider to take possession of the ball, the next pass then becomes the option and time and time again we see the ball being passed back either to Jorginho or to the central defenders on the first line. City will press Chelsea heavily in the build-up phase in order to further complicate the attempted progression of the ball through Jorginho. Expect to see the Italian international midfielder closed down by at least one of the two advanced central midfielders. Also, we should see the forward player for City actively look to crash back to close Jorginho down from behind. The lateral pass from Jorginho and the back pass to the central defenders will also be pressed by the wide forwards and the central midfielders of City. We will see the home side attempt to strangle the attacking phase before they even get out of their own half. With Manchester City coming out of a small dip in form and looking to reign in Liverpool at the top of the Premier League table we should expect to see a stronger display. It is unusual for Pep Guardiola to struggle with the same ball progression issues twice against the same team. Chelsea were able to negate Fernandinho the first time around but it is unlikely this will continue to be the case this time around. 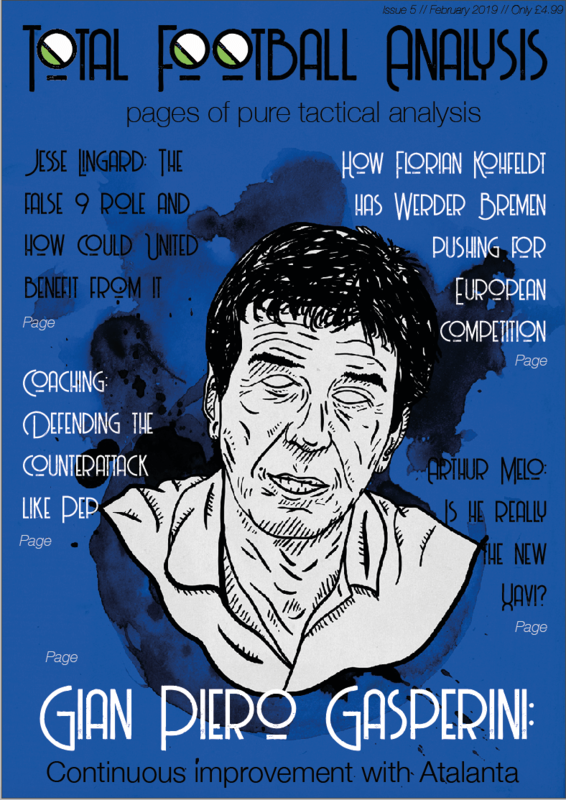 If you enjoy the tactical analysis from Total Football Analysis Magazine you can now pre-order their February Magazine by clicking here. At just £4.99 for over 100 pages of analysis content or £50 for an annual subscription, it is fantastic value for money.